Rack 'N' Roll is played on a 54' by 27' carpeted field. The center of the playing field is occupied by the main scoring structure, the rack, containing 24 spider legs. The game is played by two alliances, red and blue, each consisting of three robots. To score, robots use tubes of their own colour to create columns or rows of their own alliances' colour. 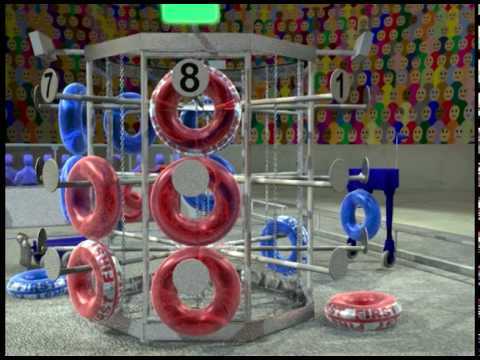 The game consists of a 15 second autonomous period where robots attempt to score "keeper" tubes on the rack and a 2 minute driver control period. Coloured tubes ("ringers") are worth 2 points and increase exponentially based on the length of the column or row. To negate points, black spoiler tubes may be placed over top of alliance ringers to nullify that tube's value and limit the exponential scoring. Alliances may score additional points if, by the end of the match, their robots in their home zone are lifted either 4" (15 points) or 12" (30 points) off the floor. As successful as the 2006 season was, Team 1114 looked to keep improving. Two new teams were founded, Team 2166 at Appleby College in Oakvile, and Team 2056 at Orchard Park SS in Stoney Creek. For the first time since 2004, Simbotics did not actively collaborate with any other teams, ending the run of the Niagara Triplets. Still, the team was able to achieve the same types of success that was found during the triplet era. Two regional victories in FRC by Simbot "Prime" took place in Waterloo and Toronto. 2007 also marked a new accomplishment for the team, winning the prestigious Indiana Robotics Invitational over the summer. This event featured the best teams from across FIRST, in what was one of the toughest competitions in FIRST history. Chairman's Presenters: Lindsay D., Matt C., Candice E.